Every February, the Bureau of Labor Statistics (BLS) updates employment data for the prior year and beyond. 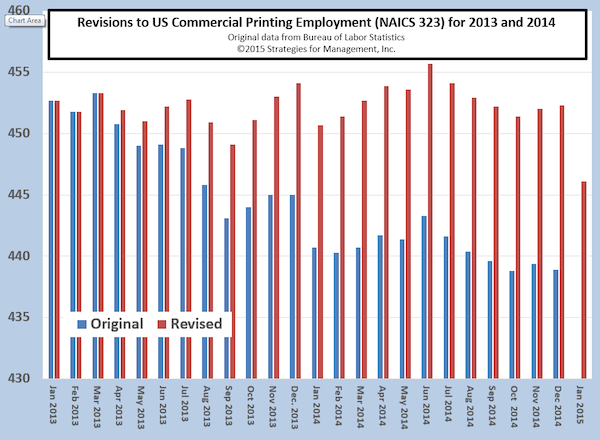 This year, the revisions to printing industry employment went back to April 2013. When the BLS calculates employment, especially for industries, it uses estimation methods because actual data are not readily available. That actual data are derived from the Social Security tax filings of employers. In this case, the BLS was underreporting employment, especially in mid-2014. Employment data are used as an input into Commerce Department data for the estimation of industry shipments. Those new employment data, though not released publicly, were probably used in recent months shipment calculations when 2014 shipments began to have favorable comparisons to 2013. It is possible, based on these data, that 2014 industry shipments will be revised up in the annual mid-May shipment revision report. An educated guess would put the change at approximately $1 billion, bringing shipments from +0.2% in current dollars to about +1.5%, or flat with 2013 after adjusting for inflation. Nonetheless, employment in December 2014 was less than December 2013. As can be seen in the chart, January 2015 employment is reported as dropping considerably. January and February tend to be slow months, and March can be one of the best. February employment may rise in anticipation.